Doctoring eyes again this a.m. in our last big bunch of weaned calves, a problem exacerbated by tall feed. Temperatures have been running over 100 degrees, the creek’s quit running, summer’s here. We’ve another small bunch of calves yet to gather and wean and then we’ll be done with weaning. Dark mornings and high heat have tempered my posting here. Not much in the mood for poetry or photography, but nothing stays the same ( I hope). As always, our primary concern during the weaning process is to reduce stress on the calves. Last week’s heifer calves above have adapted easily to their new routine on the irrigated pasture without mothers to comfort and direct them. 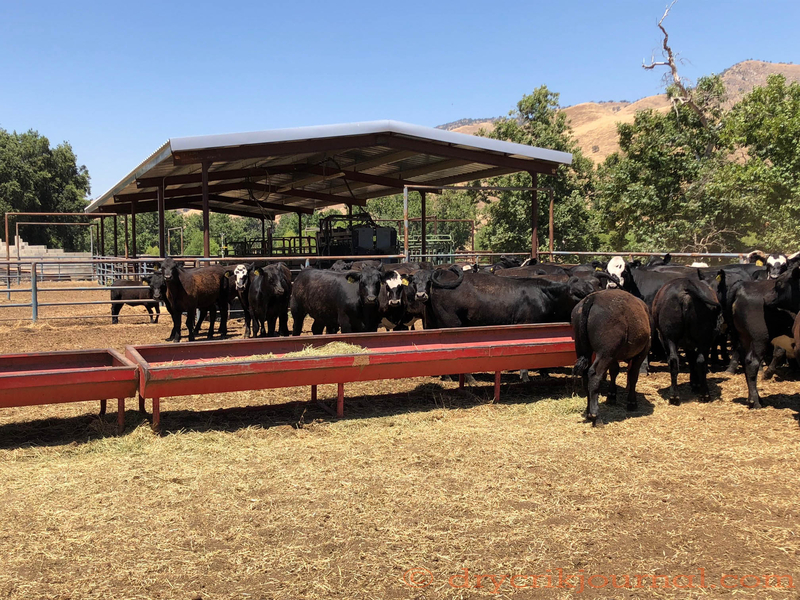 In the process of upgrading our processing area with a hydraulic squeeze and shed roof, we’ve also offered some shade in 100-degree temperatures. This week’s bunch of steers and heifers have found comfort in the new enclosure during the day, free to go to hay and water when they please. 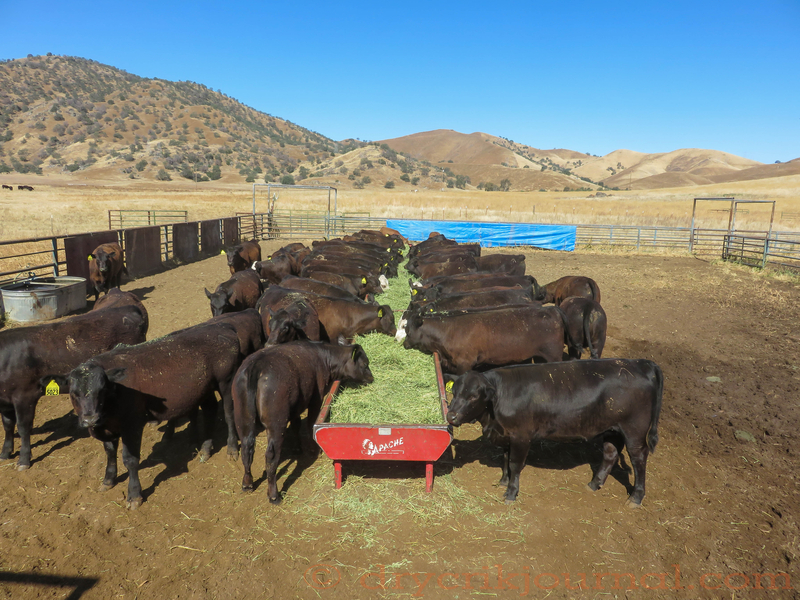 In the interests of journaling, these steers and heifers averaged 722 lbs. when unloaded at the corrals after a 45 minute haul, heavier than last week’s calves: steers averaging 731 lbs. in the auction ring, and the heifers averaging 712 lbs. before turned out on the irrigated pasture. We began weaning our first bunch of calves last week, three weeks earlier than normal, due to the lack of rain in March and April. 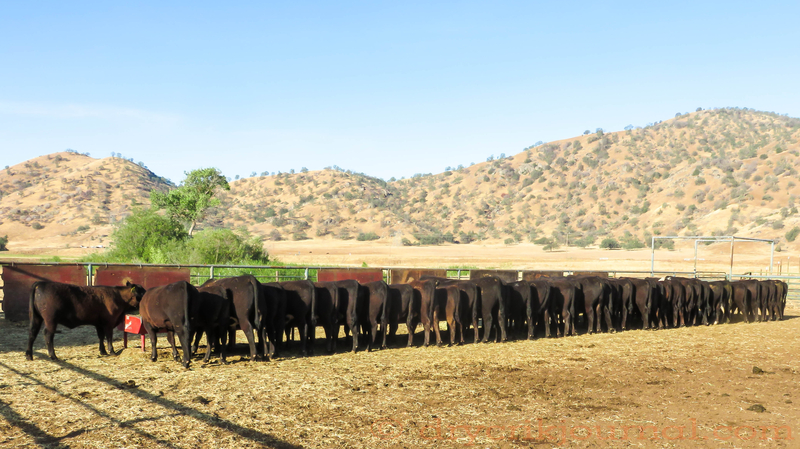 From second-calf heifers sired by Vintage Angus bills, all of these calves are headed to Visalia Livestock Market on Tuesday. The whole bunch averages 600 lbs. 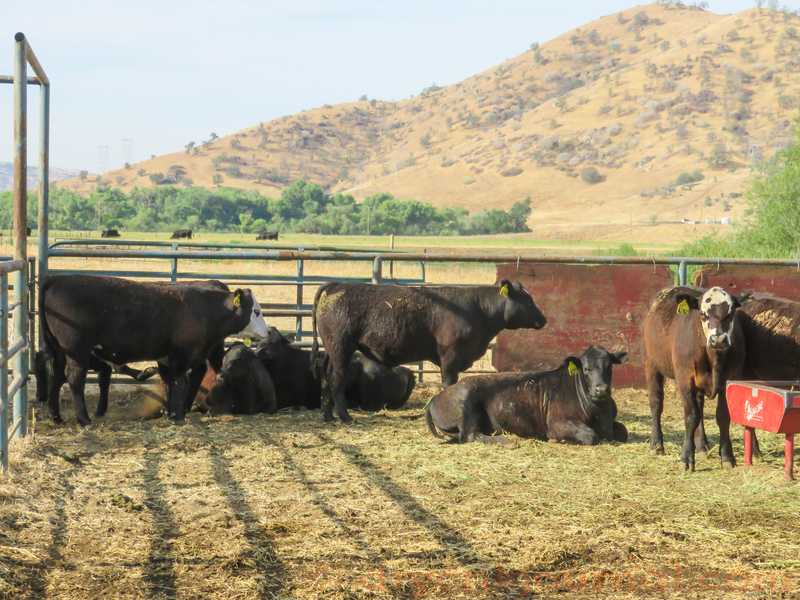 Though lighter than normal, there are some heifers we would have liked to keep for replacements, but our continuing drought conditions and uncertain feed and water resources make that option impractical. 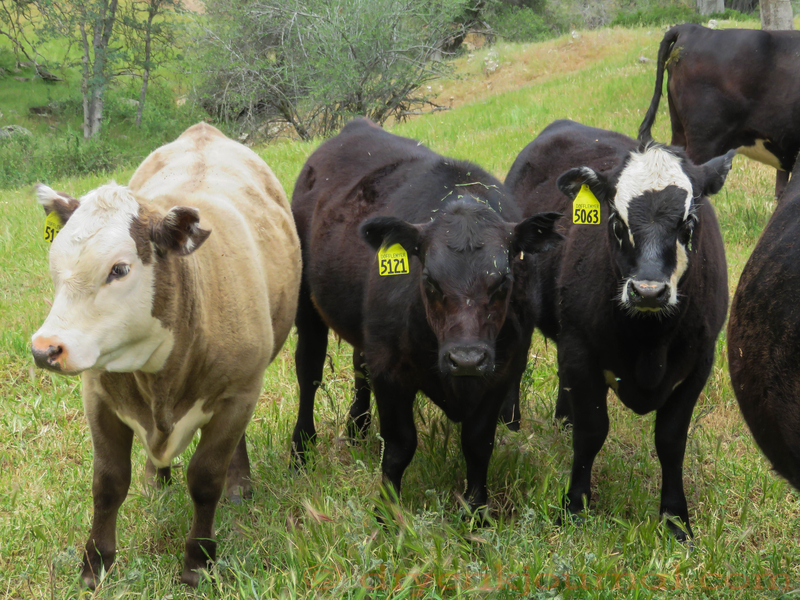 Whether Climate Change or other weather phenomenon, we have come to consider our circumstances to be the new normal for Sierra Nevada foothill ranches in California where cow numbers have been reduced by 40%. After three years of drought, our springs which are dependent on the Sierra snowpack, and our stockwater ponds which are dependent on rain, are severely impacted, some dry already before summer’s begun. Each operation continues to adapt to diminishing resources as we try to hold our cow herds intact, having already culled deeply in 2013 and 2014. 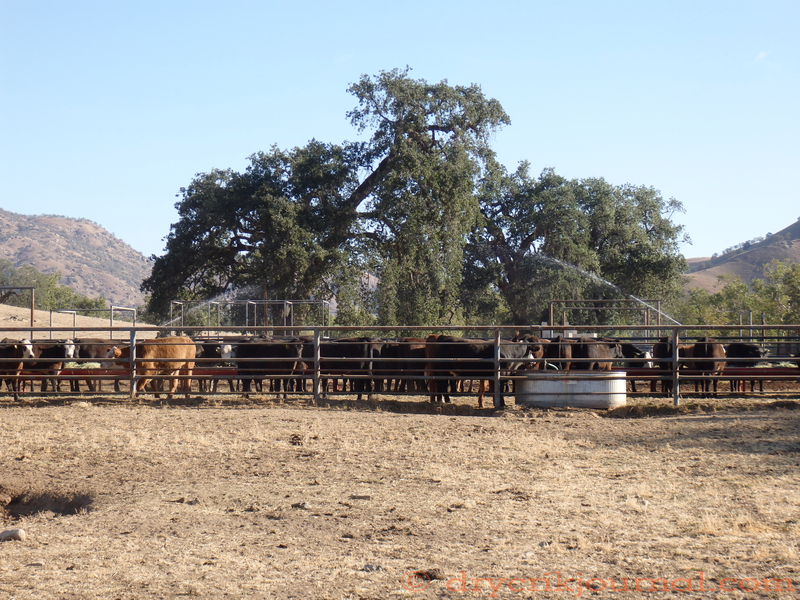 As we head into our fourth year of drought, we’ve had to change our perspective, hoping to offset our smaller numbers with a good cattle market. It’s been a long, dry year, but we’ve begun to breathe easier now that our last bunch of calves is in the weaning pen and headed to town tomorrow morning. Born last fall, they are averaging about 100 lbs. lighter than normal due to the drought, but current prices more than make up the difference. The country we graze is cross-fenced into pastures. We gather each twice a year to brand and wean while culling the cows that don’t fit our program either due to age or late calving dates. It takes about six weeks for us to wean all our calves, but longer to brand when it rains and while we’re helping our neighbors. We try to keep our cows in the same pasture their entire lives here, familiar ground where they can make homes and the gather becomes routine. 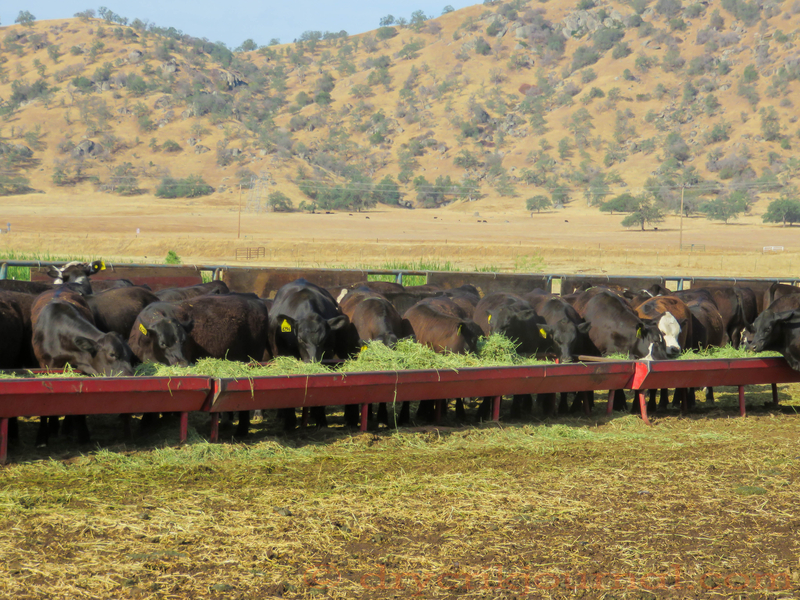 Because of our terrain, rotational grazing is impracticable—so we understock to meet most feed conditions instead. 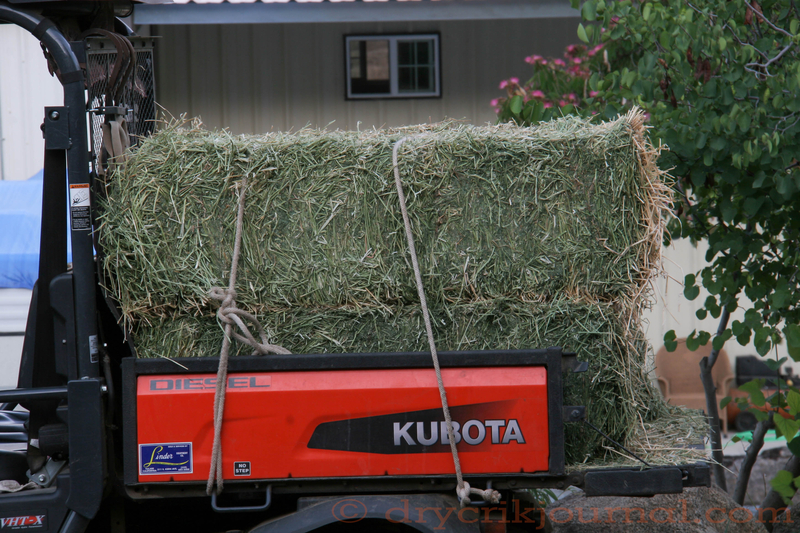 This second year of drought, however, has reduced our cowherd by 40% while feeding 500 tons of alfalfa since last fall. Because of the time and feed required for a heifer to have her first calf, we kept no replacement heifers this year. It’s disappointing for Robbin and I to see them go and the efforts of the past twenty years reduced so drastically, but we hope to take advantage of this heavy culling by improving the genetics of our cows into the future. We are encouraged with a good base to work with, as our cowherd now is fairly young, a third of which are first and second-calf cows. Near term, we concentrate on improving stockwater until it might rain again this fall.